Going on a dedicated landscape photography trip to take pictures of incredible vistas is a dream come true. We get to spend days exploring stunning landscapes, being in the moment as sunrise and sunset light transform a scene, capturing every nuance with the camera. I’m fortunate to be able to this several times every year and usually by the time the trip is over, there are literally hundreds (sometimes thousands) of gigabytes worth of photos from my Sony α7R III to show for it. Usually. I just got back from a trip to Oregon with a few fellow photographers and from the beginning, things just didn’t go our way. We started the trip by driving down to Bandon for four nights. We missed sunset the first night because of the drive, and that was likely our only shot at any color. For the rest of our time there, it was foggy and overcast. We made the best of it though, going out several times to photograph the sea stacks and surrounding beauty. After Bandon, we decided to drive another five hours to photograph Proxy Falls. Proxy Falls is a location I’ve wanted to see since the beginning of my landscape photography career, so the anticipation was high! The hike is rather easy, just a three-mile loop trail with a bit of scrambling down to the falls at the end. But as luck would have it, the road leading up to the trailhead was still closed for the winter, so we had to park at the snow gate and walk up the road an additional two miles each way, turning a three mile hike into a seven-mile hike. As we were hiking up the road, a hiker passed us on her way out and commented that the falls were “raging.” We didn’t know if she was being sarcastic or truthful, but since we thought the latter would be a good thing, we pressed on hopefully. When we finally reached the falls, we realized we were wrong. The falls were indeed raging, but that was in fact a bad thing photographically speaking. 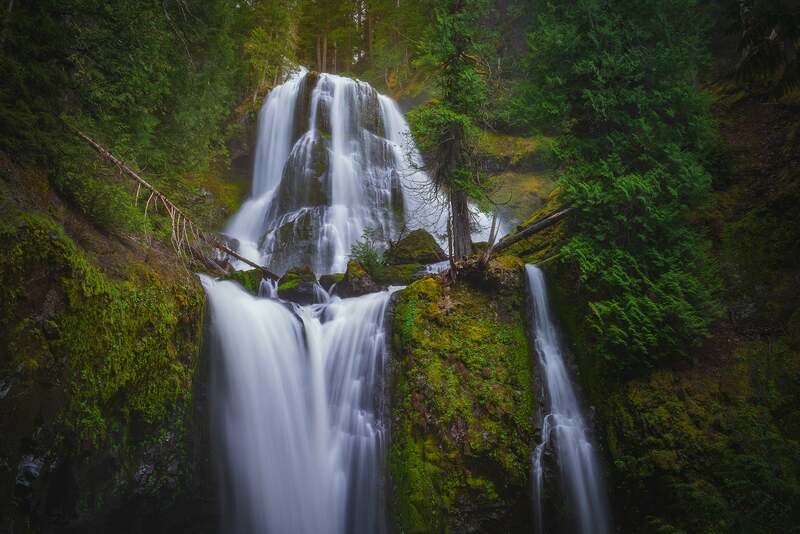 If you look up photos of Proxy Falls, you’ll see a jaw dropping display of cascading falls separated by bright green moss. On this day, the falls were raging so hard that you couldn’t even see the moss. They were raging so hard, in fact, that we couldn’t even get within 100 yards of the base without getting drenched by spray. Instead, we had to settle for the view from above. After that, we drove up to Portland for the last leg of our trip. On the first day, we headed into the gorge, but the fire damage from last year was quite a bit worse than we had anticipated. A few lesser known spots we visited had taken significant damage and the crowds were so bad at the well-known spots that it wasn’t really worth stopping at since we’d already photographed them before. The next day, we drove up to Silver Falls. Thunderstorms are rare in the Pacific Northwest, but right as we got close to the trailhead, a storm formed comically right over our heads. I looked it up on radar and it was almost completely stationary. After we admitted defeat, it took less than ten minutes of driving to get out of the rain where we were greeted by clear skies. You can’t make this stuff up! Finally, on one of the last days, we had some luck on our hike to Falls Creek Falls and Panther Creek. The light was incredible, the falls were drop dead gorgeous, and we all got some great shots. Here’s the thing though, despite all that went wrong on this trip, we all still had a great time! Sure, we had our moments where we all felt sorry for ourselves and down on our luck, but those moments were short lived. We ate at some incredible restaurants, visited some great breweries, spent eight days hiking through forests and exploring coastlines, and laughed our heads off the entire way. The moral of the story is that these things happen; and if getting incredible pictures is the only thing on your agenda, it’s just a matter of time before you will be sorely disappointed. Don’t miss the forest for the trees. Looking For Motivation To Get In Shape? Your Landscape Photography Might Depend On It!